Wow! It’s been a big couple of weeks leading up to Hair Expo and a very successful event. We have a star in our midst! Luvies, have you been to our new Bondi Salon yet? If you have, you would have met Stephen Grechy, our Apprentice Student Cutter of the Year, 2012. This is the second year in a row Stephen has won this competition. How cool is that? The competition is part of Hair Expo, which is always a massive time for our salon. Having Stephen win again was so exciting. I want all my team to be the best they can be and I will always encourage them to develop their skills in wherever their passion lies. Competitions are one way to do this. The Apprentice Student Cutting Competition is conducted live on stage so you need to be able to perform under stress. The winner needs to pull together a whole look while demonstrating their cutting and styling ability. That’s a lot of pressure for 45 minutes of work and Stephen did really well on the day. But he also did lots and lots of practice before hand. It’s not luck that he won this competition. He works really hard to develop his natural talent. He practices more than anyone else in the team and is the last one to leave at night and first in, in the morning. To take out the title, Stephen needed to provide a finished “look” that was in line with “new seasonal hair fashion trends”. Providing his own model, he needed to think about make-up, clothing…the whole package! I love this because the competition recognises that hairstyles are an integral part of fashion. For our clients it’s not just about their hair. They are looking to create an overall look, and the best hairdressers will be able to work to a client’s lifestyle. Only use the models hair. No hairpieces or wigs were allowed. Stephen delivered a short hair cut that was emphasised by a pink and blonde colour work he completed a few days earlier. Very “on-trend”. The prized Hair Expo Trophy. Congratulations Stephen from everyone at Stevie English Hair! If you would like to get your hair cut from an award winning hairdresser please call our Bondi Salon on 02 9387 7791 and book in to see Stephen! Are you In a Royal Rut? 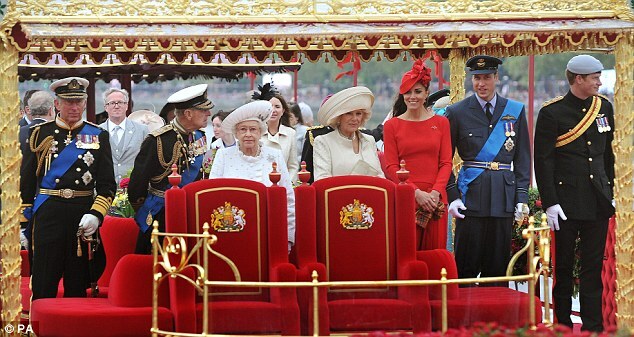 As a “pommie”, it’s been wonderful to see the great excitement around Lizzie’s diamond Jubilee. It’s really been a celebration of everything English! The fan fair and ceremony, the union jacks flying proudly, the English Geezas ( not sure you can royals Geezas...) looking so smart in their regal get up and Kate and even Camilla looking elegant…. And of course Queen Lizzy dressed beautifully, always in gloves and a hat, with her bag in the crook of her arm. 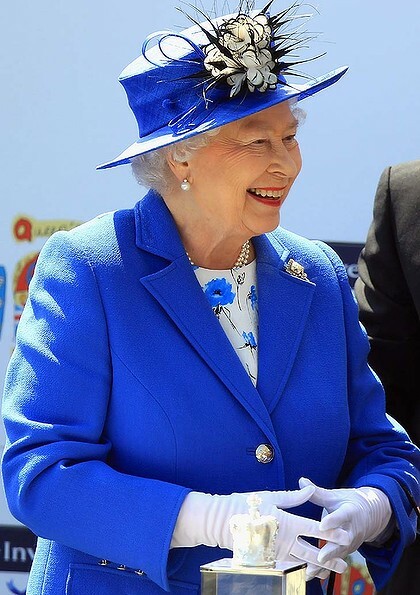 Blue has always been a great colour for Liz. A change will make you feel great! Nothing better than a new do to spice up your life. Chances are your current hair-style may not suit you any more. We all change over time (body shape, colouring and lifestyle) and sometimes the hair-style that suited you, say in your 20’s, is just not going to cut it in your 40’s, 50’s and beyond! Fashion changes - You know it. Hair styles and fashion go hand-in-hand. Time to get current. Rather than waiting to be cool again! There are so many options now. Short, mid length or long, and the variety of colours are astounding and easy to achieve and maintain! As the weather closes in and you are stuck indoors more you can go for a more styled and polished look as it won’t get wrecked by heat and humidity. So how do you work out how to change your hair-style? There’s a few ways I like to suggest. 1. Check out your favourite celebrities. They get access to the best hairdressers and stylists and are often wearing the latest styles and colours. 2. Check out your friends and work colleagues what do you admire about their hair? Could that work for you? 3. Think about your lifestyle. How much time and energy are you willing to invest in your “do” each day? How often do you want to visit the hairdresser's to keep it looking fresh? 4. Lastly my favourite tip, come in and see us at Stevie English Hair. We LOVE doing makeovers. If you would like a change, massive or subtle come see the clever teams either in Glebe 94237033 or Bondi 93877791. This weekend is hair expo So the teams area out watching, educating, competing and for good measure a little partying everything hair.